British Man Accused Of Spying Is Sentenced To Life In Prison In UAE Matthew Hedges, 31, was detained at Dubai International Airport on May 5 after a two-week research trip for his doctoral thesis on Emirati security and foreign policy, according to his wife. This undated family photo shows Matthew Hedges with his wife, Daniela Tejada. On Wednesday, Hedges was convicted of spying and given a life sentence by a court in the United Arab Emirates. A 31-year-old British man accused of spying for the U.K. government while on an apparent academic research trip in the United Arab Emirates was handed a life sentence Wednesday. 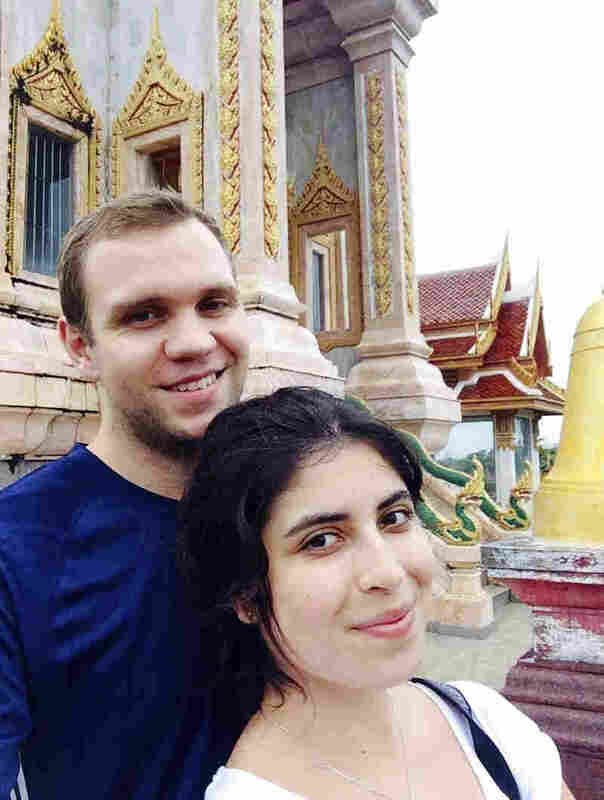 Matthew Hedges, a doctoral candidate at England's Durham University, was detained at Dubai International Airport on May 5 after a two-week research trip for his thesis on Emirati security and foreign policy, his wife, Daniela Tejada, told Human Rights Watch. Tejada said her husband spent some five months behind bars in the UAE, much of it in solitary confinement, without having been charged and without access to a lawyer. Hedges was eventually accused of "spying on the UAE and providing sensitive security and intelligence information to third parties," according to a statement from the Abu Dhabi Federal Court of Appeals, as translated by The National. The verdict against Hedges was delivered during a hearing that his lawyer did not attend and that took just five minutes, Reuters reports, citing family members. They said Hedges had been made to sign a confession in Arabic that he did not understand and that his research notes were used as evidence against him. "There has been no information given on what basis Matt was handed this sentence and no reason to believe that Matt was conducting anything other than legitimate academic research," Stuart Corbridge, Durham University's vice-chancellor, said in a statement. "A life sentence includes a maximum of 25 years in jail and is followed by deportations for non-Emiratis. Mr Hedges will be deported upon completion of his sentence and was also ordered to pay all legal fees. "The court stated that his devices and research would be confiscated. Mr Hedges has the right to appeal within a maximum of 30 days." U.K. Prime Minister Theresa May expressed her deep disappointment at the verdict. "We are raising it with the Emirati authorities at the highest level," May said Wednesday while addressing Parliament. She added that the Foreign Office will remain in contact with Hedges, his family and his lawyer. In a statement, U.K. Foreign Secretary Jeremy Hunt said the verdict runs contrary to earlier assurances from the UAE — a country the U.K. considers to be a "friend and trusted partner." "I have repeatedly made clear that the handling of this case by the UAE authorities will have repercussions for the relationship between our two countries, which has to be built on trust," Hunt said. "I regret the fact that we have reached this position and I urge the UAE to reconsider." News on Matthew Hedges extremely worrying. We have seen no evidence to back up charges against him. FCO will do ALL we can to get him home & I will meet his wife Daniela tmrw. UAE claim to be friend & ally of the UK so there will be serious diplomatic consequences. Unacceptable. John Williams of Durham University's School of Government and International Affairs, said in a statement that the case against Hedges could be chilling for academia as a whole. "The allegations of espionage are baseless and a profound threat to the pursuit of legitimate academic enquiry, not just by Matt but by all academics working on and in the UAE," Williams said. Since 2011, the UAE government has grown increasingly repressive, according to Human Rights Watch, citing multiple violations of due process. In May, the same month Hedges was arrested, the UAE sentenced human rights activist Ahmed Mansoor to a decade behind bars for social media posts deemed critical of the government. Hunt said he planned to meet with Tejada on Thursday to discuss Hedges' situation. "I am very scared for Matt," said Tejada, who was in the courtroom on Wednesday, according to The Associated Press. "I don't know where they are taking him or what will happen now. Our nightmare has gotten even worse."